Robert and the weatherman | Mystère et boules de gomme ! There is information on Gillot-Pétré here and here. 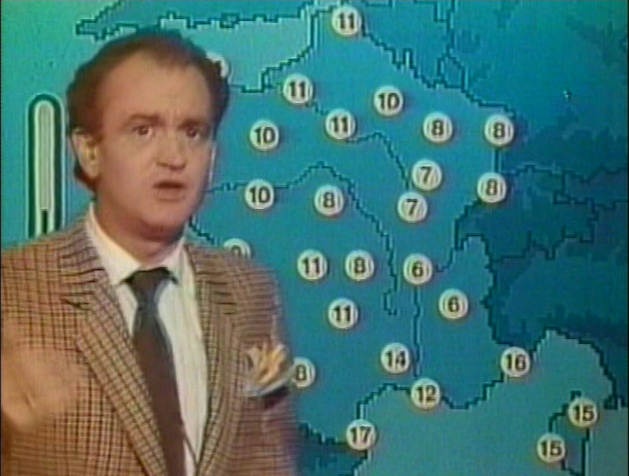 But something bizarre about the weather forecast we see him giving on TV: the temperatures reported from French cities are all between 7 and 11 degrees Celsius (except for Perpignan at a balmy 17). This is 45-52 degrees Farenheit, hardly temperatures typical for summertime, the season it is supposed to be in the episode. Highlighting the impression that temperatures are higher than we see on the map of France, Monsieur Belleau immediately says after the snippet of Gillot-Pétré’s forecast « Dites donc, il fait bien chaud, ici. Allons un moment sur le balcon » where he shows Robert « la vue imprenable. » Can anyone recall any other cameos in FIA? I was thrilled to hear Colombian music being played at the scene when they go to the movies and there are commercials of Nescafe. I Grew up with that music in the background and the song « La Colegiala » brought many happy memories. Good cameo although it is just Audio. I of course am Colombian and want to go to Paris someday. That’s why I am learning to speak French in the first place. I already speak Spanish and English but will feel more complete learning as much French as I can. Bring back FIA so we can continue to learn the language. Please find a way to start a second generation of FIA! you can do it. I have a cameo for you: Michael Wiseman. IMDB credits him as « Obnoxious French student »—you remember, from the first few episodes. Judging by his filmography, FIA was his springboard into a successful caree as a television actor. If he was playing himself in FIA, then I guess that counts as a cameo. There’s a clip of him when he almost drops dead on the set while trying to do the weather. True, Vicki, it’s supposed to be early June in the episode, technically spring, not summer, but still those temperatures on the weather report are too low. Also notice that Monsieur Gillot-Pétré is in a different shirt, tie and jacket in the two scenes! Yea! A new year and a new post! It’s shocking that both of those bio’s fail to mention his illustrious cameo on FIA. Ah, well…..nice observation on the temperatures not matching the season. 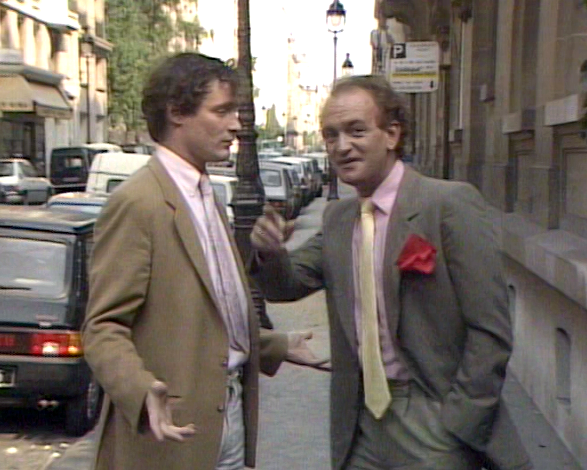 Robert arrived in Paris somewhere around « le vingt-neuf Mai ». So, by the time he went to dinner at chez Belleau, it must have been early June…I mean, Juin. Yes, you would expect the weather to be a bit warmer. I’m sure Prof. Capretz did not suspect that we would be so obsessive as to check out the accuracy of a snippet of a weather report. But then he probably didn’t realize what big fans his show would have. Thanks for updating the site!